Note: I know, I know. I said five years ago that I would "never set foot in Perani Arena again" when the Warriors arrived in town and the Generals were forced to fold. That "boycott" lasted nearly 4 years. I went to a game in 2013-14, and one in 2014-15. I like the NAHL, especially after all those games in Port Huron. Hockey's hockey, I guess. Hell, I even own a Warriors t-shirt and puck now, so they can't be that bad anymore! 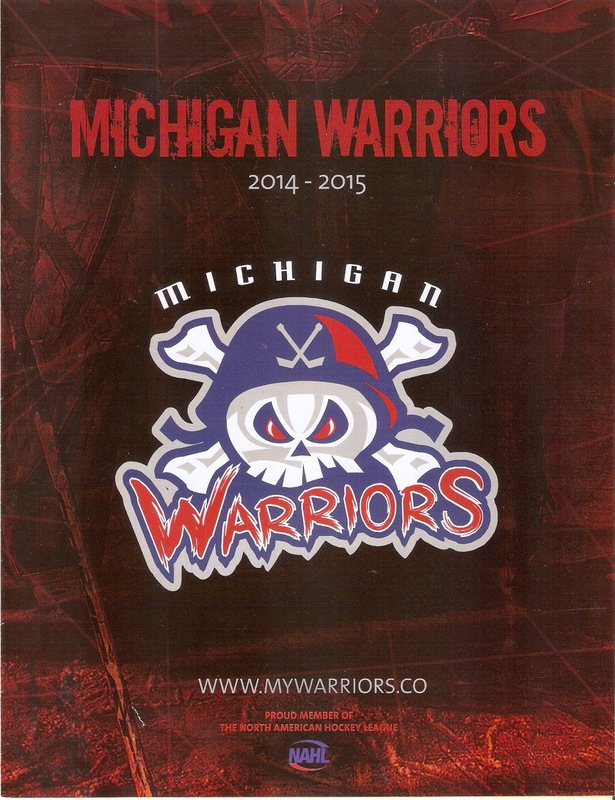 The Michigan Warriors are in their fifth year of existence. They are members of the North American Hockey League (NAHL), a mid-level junior league in the US and Canada. They play their home games in Flint's Perani Arena. Moe Mantha, former head coach of the Saginaw Spirit, is still Coach/GM of the Warriors, the only one they've known. The Warriors were coming off a North Division Championship in 2013-14, the second in four years for the team. After getting off to a slow start, the season went into a tailspin due to the rumors of Perani Arena's sale and the uncertain future of the franchise. After IMS Hockey purchased Perani Arena, the Warriors were notified that they would not be welcomed back to the arena for 2015-16 and would be replaced by the OHL's Flint Firebirds. Currently, the Warriors sit three points behind the Johnstown Tomahawks for the last playoff spot in the North. I won't go into the stats for this year's team since, well, the season is still going on. This technically isn't a program, more like a roster booklet. There are pictures and stats for each player on the Warriors roster, as well as short bios on Coach Moe Mantha and Assistant Coach Jon Jepson. There's a section that shows the meaning of referee hand signals a column for upcoming promotions. There is an insert giving the updated statistics for both the Warriors and that night's opponent, the Janesville Jets. There are a few advertisements, incluing CN Railroad, Donna's Donuts, Blue Lakes Charter and Tours and Applebees. That's about it. Pretty simple, but way more than the Fighting Falcons ever had. Michigan entered that night's contest in last place with a 17-23-9 record. Janesville, on the other hand, was running away with the North Division with a 40-9-1 record. I expected a lopsided game, but the Warriors hung in there, thanks to the play of their netminder, Ryan Wischow. Janesville took a 2-0 lead early in the third and hung on for a 2-1 victory. The announced attendance was 823, a bit higher than my guess of 500. Aftermath: As I wrote earlier, the Warriors face an uncertain future. After five years in Flint, the team was successful on the ice, winning two North Division titles and coming within a goal of winning the Robertson Cup in 2010-11. Off the ice (at least attendance-wise), the team has struggled mightily. In each of their five seasons, the Warriors have been in the bottom third of the NAHL in attendance, only once averaging over 1000 per game in a season. Upon their purchase of Perani Arena, IMS Hockey notified the Warriors that they would not be welcomed back for the upcoming season, being replaced by the OHL's Flint Firebirds. As of now, the latest rumor about the Warriors is that the team will be sold and relocated to Brooklyn, New York, for the 2015-16 season. UPDATE: The Warriors made the NAHL playoffs this year, edging out Johnstown for the final spot. They will face the Janesville Jets in Round One (best-of-five), a team that set league records for wins and points. Games 3 and (if necessary) 4 will be played at Iceland Arena. Perani Arena was not available due to OHL-required renovations to that building. ANOTHER UPDATE: The Warriors were rumored to be sold to a group looking to move the franchise to Brooklyn, New York. However, the sale fell through on the buyers' side and the Warriors ended up folding.